Thunderheart has thirteen songs on it… twelve plus one. The number twelve has significant spiritual mystery attached to it. There are twelve calendar months, twelve knights of the round table, twelve apostles and twelve inner aspects to the human being, for example… so the twelve has great symbolic power, representing much that lies between heaven and earth of the mystery between man and his maker. The twelve plus one configuration takes it even further… the twelve calendar months make up the one year; there were twelve knights and one King; twelve apostles and one Christ, and twelve aspects of the one individual. So the twelve makes up the One. 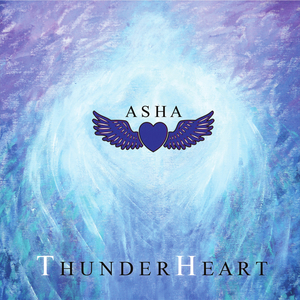 “Thunderheart” is a collection of songs that together constitute one statement; one sentiment... twelve aspects of one inspiration and one feeling. “Thunderheart” is art based on what I am discovering on the journey toward the One... towards Christ in the heart... the eternal in the mortal... the all and everything in the individual... the journey from the Sun King to the heart, and thence to the man. The mythology around the Grail Knights of the Round Table, Jesus and the Apostles, the Knights Templar, and the Rosicrucian alchemists (both also twelve plus one communities) are all depictions of the spiritualisation of the ordinary self, and these songs contain something of the pain and joy I am experiencing on that journey myself... a journey of love and loss; of losing and finding, of suffering and redemption.